Harmoniums to ukuleles – Bentinck Street is littered with music shops that supply you with world-class instruments. And if you have the time, strike up a conversation with the shop people. They will tell you about the many famous musicians who have been here (Yehudi Menuhin, for instance). Not just one, you’ll find tens of music shops along Bentinck Street. If you walk from Paradise Cinema towards Lal Bazaar Police Station and beyond, you’ll find the stores on either side of the road (particularly on the side of the police station). The shops have been around for generations and have supplied instruments to everyone from beginners to internationally-renowned artists like violinist Yehudi Menuhin. Both Western and Indian instruments are available. 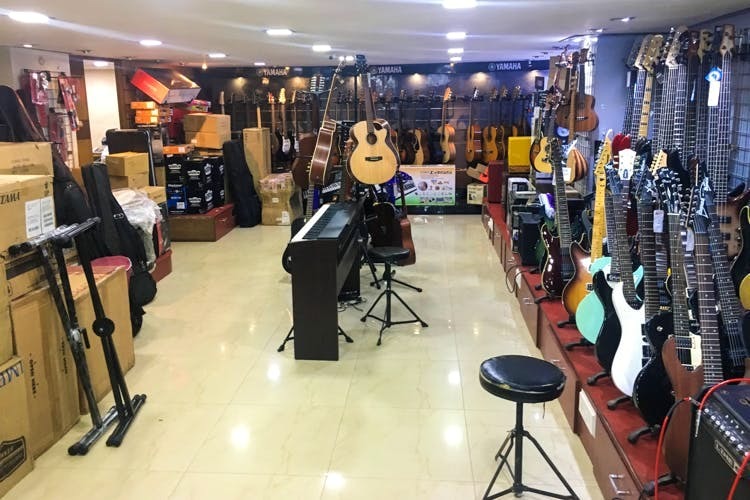 There are shops that are dedicated to just one instrument and some that do all percussion or all stringed instruments under one roof. Keyboards, violins, drums, piano, ukulele, dotara, harmoniums, guitars, tablas, flutes, every musical instrument for every level of professionalism (from beginners to international-level artists). If you walk down the street, you’ll see workers sitting on the floor and making the instruments right in front of you. A chat with the workers will reveal that some of them have been in the business for generations. They sit and make one instrument from scratch to finish – it can take over a week to make a single piece. Since they make the instruments, you can go in and ask for it to be customised to your liking. So kiss your broken strings goodbye. They also repair and mend instruments.